Cloisonné is one of the most famous arts and crafts in Beijing. 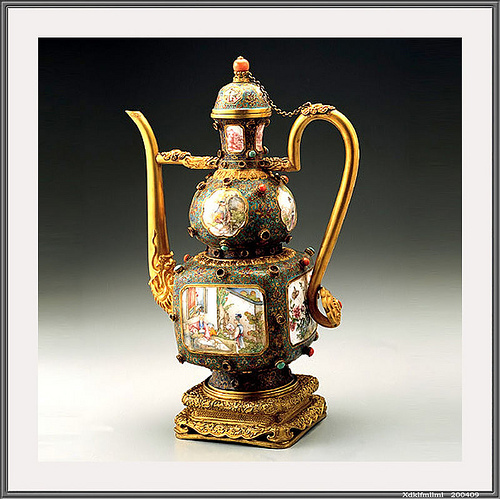 cloisonne is a kind of traditional handicraft of enamelware created more than 500 years ago during the 5th Emperor Xuan De’s reign (1426-1435) in the Ming Dynasty. Later, this kind of enamelware was known as “Jingtai Blue” in Chinese. It was so called because the color blue is the most frequently used color for enameling. Jingtai actually is the reign title of the Emperor in the Ming Dynasty. Enamelware became very popular during this emperor’s reign (1450-1456). Cloisonne enamel is so beautiful with its elegant molding, brilliant and dazzling color, and splendid and graceful design. There is a great variety of cloisonne products , such as vases, jars, bowls, boxes, plates, ashtrays and even some bracelets, necklaces, earrings and chopsticks “’. All made of Cloisonne. It is really a beautiful and magnificent handicraft art in Beijing.